A long term plan for the city of Detroit must include recognizing the city has far too much housing and vacant lots to expect all will be filled by future new residents. This large of an influx will not happen for decades if ever. 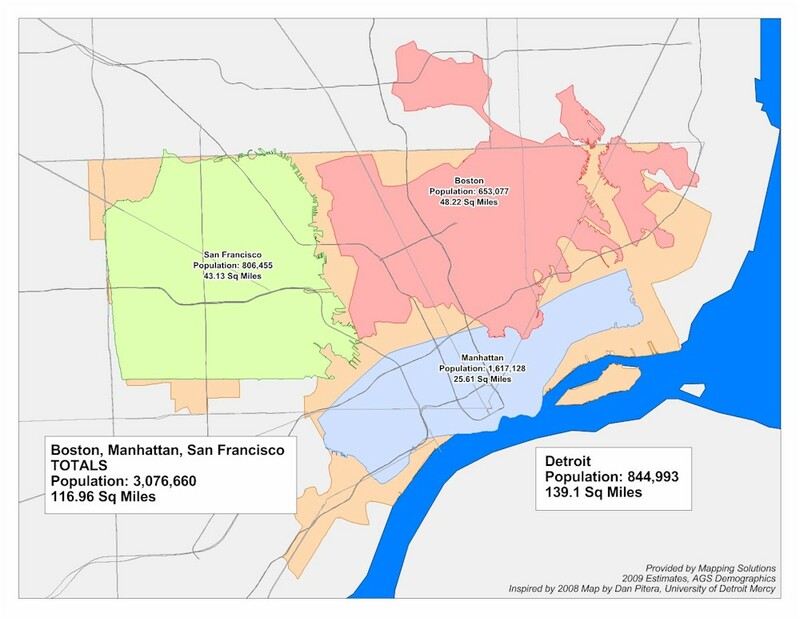 A good illustration of this problem is comparing Detroit to the combined areas of San Francisco, Boston and Manhattan. This graphic below was created by Mapping Solutions and is based on the population numbers for the year 2009. 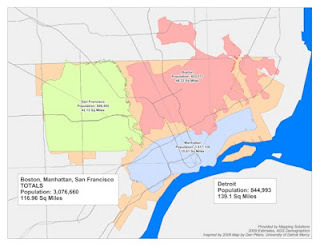 Detroit's population in 2009 was 845,000 with an area of 139 square miles.The population per square mile was 6,079. At its peak, Detroit had a population of approximately 14,388 per square mile. "Detroit is not too big, its economy is too small." I disagree. It is going to take too long to grow the economy to the point where it will attract enough residents to double its size. The combined population in 2009 for San Francisco, Boston and Manhattan totaled 3,076,660 with a combined area of 117 square miles. The population per square mile was 26,296. This is a population density of 4.3 times greater than Detroit. This highlights the need to congregate population in certain areas of the city and free up the remainder of the land for commercial use including retail, manufacturing, warehouse and entertainment. Perhaps the land made available for commerce should be primarily around the outskirts of the city's borders, therefore competing with the suburbs, with areas sprinkled in to meet the commercial needs of neighborhoods. The school district, police, fire and other departments cannot pay for the maintenance and repair of all the buildings it now operates. They need to consolidate and that means relocating families in clusters. Economic factors could be in favor of the downtown refurbished office buildings assuming they can offer lower rents than the newer, but aging, office buildings in the suburbs. Eventually this could lead to families moving back in Detroit. The mayoral campaign should be addressing these issues.